Have you noticed an increased importance and respect being given to the creative and design industries? Have you ever wondered why? …and even better, have you ever asked where did it go? I read a fantastic article the other day by David Shah called “from left to right”. 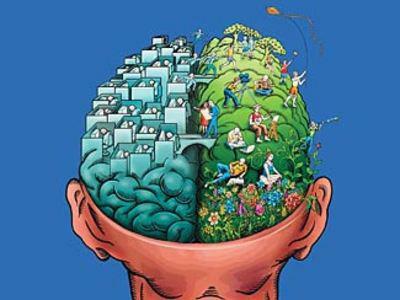 It was all about the shift from left-brain thinking to right-brain thinking. For years I have always known instinctively that technology would never be enough. Technology really came to it’s fore with IT in the 1980’s and before we knew it we were soley dependent on it. Ask yourself, how long have you gone without it? Then in the 1990’s we started moving with the ‘beat’ and everything became faster, cheaper and more convenient. Fashion too became cheaper, faster and with less creativity. It was about copying the catwalks or hollywood. That is what the whole fashion retail market is built on. Eventually there was no space or time for innovation, creativity or true design. Naturally this has meant we are out of balance. This is where we are at now: the need and want for greater meaning and the magic word: creativity. This does not mean to simply ‘create’ something but rather to do something that is difficult to automate. You need to offer what technology and/or the cheap labour markets cannot. Creativity and empathy are the building blocks of that. This is a hard challenge and is most easily seen in the growing ‘meaning’ and ‘value’ of natural, eco, green, sustainability and recycled.Â (The trend of hand-made, which is clear by the interest and support that etsy has generated, is another answer to this challenge). The drive is to offer something special, different and thought out. Perhaps it’s the exact opposite of the see-saw but perhaps that is also what we need in order to balance the extreme materialism we are surrounded by everyday. For these reasons the trends for design 2009 have been given the title “surreal” and “absurdism”. This is in changing perspectives, embracing creativity, transcending realities and redrawing the rules. It is about bringing life back to living. I am not argueing that creativity is the answer to world peace but perhaps it can bring peace to me and you. Our lives are jam-packed with technology and to-do-lists. Stop, think and do with creativity and that means, to do with meaning. This entry was posted in Blog and tagged creative trend, creativity, david shah, fashion trend history, fashion trends, handmade trends, left brain, recycled, right brain, surreal, sustainable trend, technology, thinking, trend 2009. Yes, thatÂ´s true.So agree also with you and the comment. Yes! Yes! YES! And when that happens, all us kooky, hippie, “artsy crapsy” girls (and boys) are gonna’ RULE!! Well, maybe I’m getting carried away……Will we be able to quit these jobs where we start at 8:00, sit in cubicles, make spreadsheets all day, finish at 5:00? Maybe someone will actually want to buy a quilt that I made!…What a sweet, golden, heavenly idea.